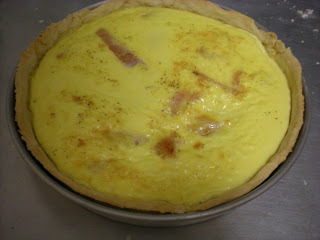 Here is a simple quiche recipe with pâte brisée. I use ham leftover, but you can use anything else. 1. 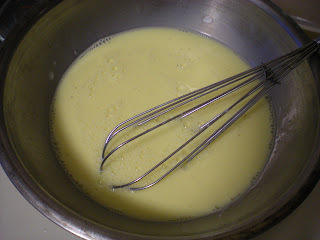 In a frying pan, heat oil over medium heat. Add onion and stir until transparent. 2. Flatten the dough slightly on lightly floured surface and dust the dough lightly before rolling it out. Start rolling at the center of the dough and work outwards. 3. 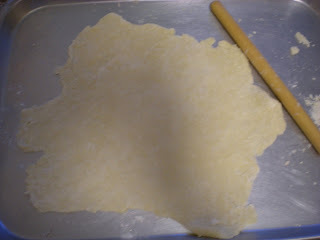 Working quickly, roll the dough into a circle ¼-inch thick or smaller. The size of the dough round should be about four inches wider in diameter than your pie pan. 4. Oil lightly baking pan and transfer dough onto it. 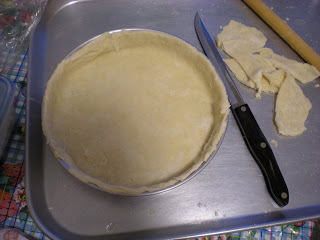 Without stretching the dough, press the pastry firmly into the pan and trim any excess dough from the edge. With fork, prick dough all over and leave it in the fridge. 5. Meanwhile, beat eggs, milk and season with salt and pepper. Preheat oven to 375F. 6. Place ham and onion on top of the dough and pour egg mixture. Bake for 35-40 minutes or until golden.